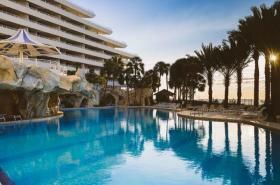 Located on beautiful Perdido Key, Eden Condominiums has been designed for those on a quest for pure elegance and style. A veritable paradise has been created by combining Eden's luxurious residences with the breath-taking beautiful emerald-green waters and pristine white sands of the Gulf of Mexico, which can be viewed from each unit. You will find that Perdido Key lends itself to panoramic views, fiery sunsets, and exhilarating days you'll always remember. 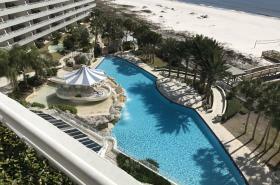 Eden, a landmark on the Gulf Coast, provides the unique combination of architecture and style found on the French Riviera with peaceful solitude found only on Perdido Key, Florida. You can lose yourself in the exotic landscaping that surrounds Eden's pools and refreshing waterfalls. Enjoy a little extra R&R with a poolside spa treatment courtesy of Eden's Emerald Oasis Day Spa. For the technology gurus, Eden offers campus wide Wi-Fi, free nationwide calling, a business center available for use and even a poolside cafe so you can watch the kids and get some work done at the same time.